This article attempts to develop a Land Bank model which will help mobilize land efficiently. The main purpose for the creation of Land Bank will be to finance the purchase of agricultural estates offered for sale and to resell the lands to farmer beneficiaries. This article gives a basic framework for Land Bank. A dualistic system of production characterizes land holdings as large land holdings and small land holdings. A large holding can be divided into small holdings and given to small and marginal farmers to enable them to earn a living. If some crops require larger area for farming, many small land holdings can be clubbed and converted into a large chunk. In order to achieve all the above stated requirements, the government can establish a financial institution like a Land Bank which purchases plantation lands with cash or bonds and sell the same to farmers in installments over a sufficiently long period of time. Broadly, there are five entities in the Land Bank framework. These are shown in Exhibit 1. Each entity is explained below. Small and marginal land owners are dependent on bank loan for their financial needs for farming. This is very difficult to obtain. So they approach money lenders who charge them high rates of interest. Sometimes their lands also become very unproductive. Thus, they do not want to cultivate the land and hence no income is generated. The land tenancy system is prevalent in India. The large land owners give land to tillers but they are not very sure of returns. So many small, marginal and large land owners will find a land bank as an appropriate intermediary for leasing their land and get good returns on that. If we take all states together then we find that both fallow land and Cultural waste land constitute around 73 % of total uncultivated land in India. Cultural waste land alone is around 48 %. This data indicates that there is lots of land available in India that can be used. Land bank is the best option in this case to get the right value of the land at the right time. Fragmentation of land is widespread in India and it is believed that fragmented nature of land holdings may play a major role in explaining low levels of agricultural productivity. Land bank will consolidate these land holding and create a big chunk out of it. The bank will then develop this land and sell or lease this bigger chunk of land area to a prospective buyer. Private entities are the independent entities like commercial malls, private buildings that house companies, industries, banks, schools, hospitals etc. Land bank framework provides flexibility to private entities in terms of buying or getting the land on lease. Public projects contain projects which are of public use like Highway construction, Drinking water protection, Afforestation, Nature restoration programs. Land bank framework provides flexibility in terms of land availability for these public entities. There are mainly two different mechanisms for in-flow and out-flow of land: a buying and selling model (traditional land banking instrument) or a leasing model. Buying & Selling Model: In a buying and selling model, the Land bank will buy land from land owner or state and sell it either third party or state. Leasing Model: Mobilizing land trough leasing contracts is less expensive than trough buying and selling models. Land bank will work as a mediator between landowners and third party in order to get the mobilization of land, promoting leasing contracts between them and giving guarantees to the process. 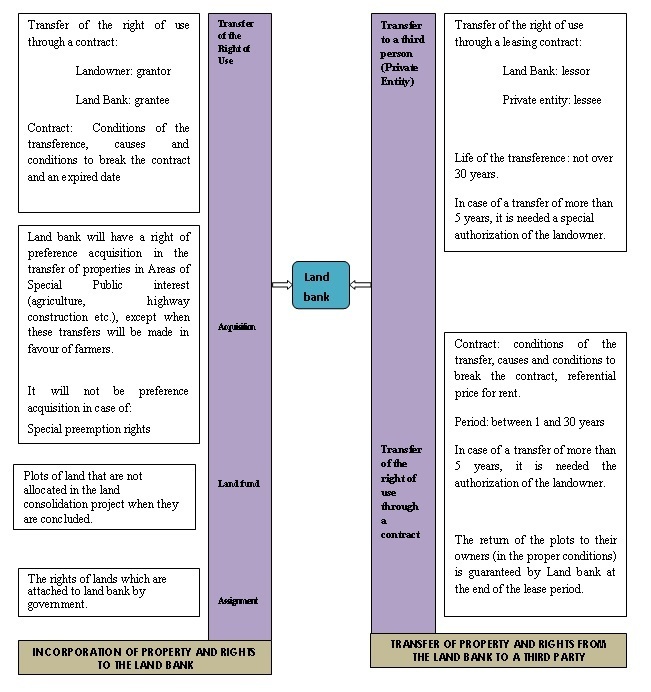 The next section provides an overview of how the Land Bank operates. The objective of land bank is to mobilize the land that is productive or unproductive or abandoned by promoting its use. 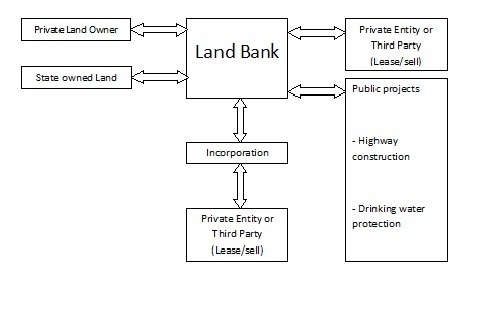 Land bank procedure is summarized in Exhibit 2. Transfer of the Right of Use (Land Owner & Land Bank): Land owners who want to lease their land to land bank will be done through a lease agreement. The transfer of the right of use will happen through a contract. When this transfer takes place then land owner will be grantor and land bank will be grantee. So the title of property will be transferred from land owner to land bank. Land Funds:Land funds are the small portions of land that are not allocated in the land consolidation project when they are concluded. Assignment: Assignment deals with the rights attached to the lands which are transferred to the land bank from land owners. These rights are clearly mentioned in the contract attached to the land. Transfer of the Right of Use (Land Bank & Third Party): The land, which land bank has acquired by lease agreement with land owners, can be used in transferring to third party. This transfer of the right of use will be done through a leasing contract. In this lease contract land bank will be lessor and third party will act as lessee. So the title of property will be transferred from land bank to the third party. Transfer of the Right of Use through a Contract:Land owners who want to lease their land to land bank will be done through a lease agreement. The transfer of the right of use will happen through a contract. When this transfer takes place, the land owner will be the grantor and land bank will be the grantee. Thus, the title of property will be transferred from land owner to land bank. The return of the plots to their owners is guaranteed by Land bank. The same land which land owner has given to land bank will be returned to the land owner. The payment of the rent or royalty to the land owner is guarantee by Land bank (even if the third party doesn�t pay). The various methods used in the valuation of land are given in the next section. Land value depends on the purpose for which that value is determined. This framework uses three types of Land Valuation methods. Comparative Unit Method is used for cultivation land that is not in use (Fallow Land). This method is used for appraising land parcels based on an estimated average or typical value for each stratum of land. Capitalization of Land Rent is for Leasing Land. The performance of land valuation through direct capitalization of land rent requires land rented or leased independently of improvements. The last method is Land Residual Capitalization which is for Barren Land. In this we apply the land residual capitalization technique with a known improvement value coupled with the absence of vacant land sales to support the land value. How the interplay of the above valuation methods and the two models for in-flow and out-flow of land result in various economies for all the entities involved, is given in the subsequent section. The three main entities involved in Land bank model are the land owner, the third party and the land bank itself. This sections talks about the economics for each entity. The land owner will lease the land to the land bank if it pays higher return on the land. Therefore, the income received from the land bank must be higher than any income he gets by leasing to other source of income he generates by doing farming. Aggregate income from not leasing and farming himself will also generate income that we can say LI. If LLB > LIndp or LLB > LI, land owner will approach to land bank for leasing of a land. If Land bank buys land from land owner at higher price (or even lower but with guarantee payment) as compared to most of the buyers in the market, the land owner will sell the land to the land bank. When land bank leases out any land and the cost of this leasing is less than what a third party could have paid, the third party will then possibly turn to land bank for leasing of land rather directly involving itself. If CLB < CIndp, then private entity will approach land bank. When land bank sells any land and the cost of this selling is less than what third party could have paid, the third party will then possibly turn to land bank for buying of land rather directly buying it. The third party may buy land from land bank at higher price as this land will be more productive and will give higher return in coming years. So he may choose to buy it from land bank even if it is at higher cost than market price. Cost of land taken on lease, C will be all the cost incurred due to taking the land on lease. Income from land given on lease, I will be all the income earned due to leasing out the land. So if I > C then bank will make profit. Purchase value of the land is the cost borne by the land bank while purchasing a particular land area. Then land bank may improve the purchased land area and make it more useful and productive, this expenses is treated as improvement expense. Sales value is the money received from third party by selling it, I. This section illustrates the advantages and disadvantages of the framework that we have proposed. Advantages: Land bank provides tools to quickly turn non agricultural land into usable parcels. The Government can use these lands for the public projects like highway construction, drinking water protection, afforestation, nature restoration and promote economic development. Similarly Land bank can also provide the land to the private entities for their commercial purpose. In this process local governments benefit from the rental paid by the private entities when land is paid on lease. Disadvantages:Buying and selling prices in various states will be ambiguous. Land bank will not deal in disputed properties, especially those under litigation. Another disadvantage is that some companies buy the lands for their projects but those projects are never carried out. Land bank model recommends a framework for banking land resource that would be helpful in addressing the current concerns of farming sector in India. A. Damodaran is a Professor in the Economics and Social Sciences Area at IIM Bangalore. He holds a Ph.D. in Economics from University of Kerala. He can be reached at damodaran@iimb.ernet.in. Hemant Kumar (PGP 2008-10) holds a B. Tech. in Computer Science & Engineering from the National Institute of Technology (NIT) Warangal. He can be reached at hemant.kumar08@iimb.ernet.in. Sher Singh Meena (PGP 2008-10) holds a B. Tech. in Computer Science & Engineering from the Indian Institute of Technology (IIT) Roorkee. He can be reached at shersingh.meena08@iimb.ernet.in.